Hematopoietic elements in this bone marrow biopsy are markedly reduced. 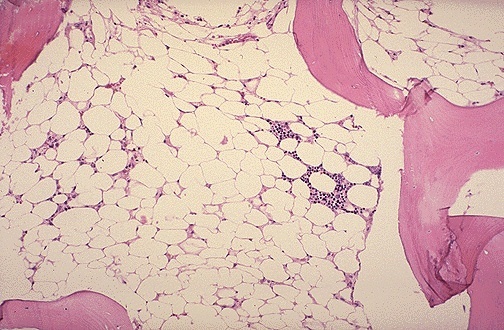 This is a case of aplastic anemia. Of course, besides, RBC's the platelets and granulocytes will often be diminished. Sometimes a drug or toxin is the cause and sometimes infection. When no known cause can be found, it is termed idiopathic aplastic anemia.